2 Nav on. Strobe off. Taxi on. Landing off. 3 Nav off. Strobe on. Taxi off. Landing on. I don't anticipate needing to use combination 3 (in red) for both sets of lights. And, in the interest of consolidating panel space, I wish to control the remaining combinations, 1, 2 and 4 (in green), with only one switch for each light set. An example of how to do that is shown below. The diode is the key to this arrangement. 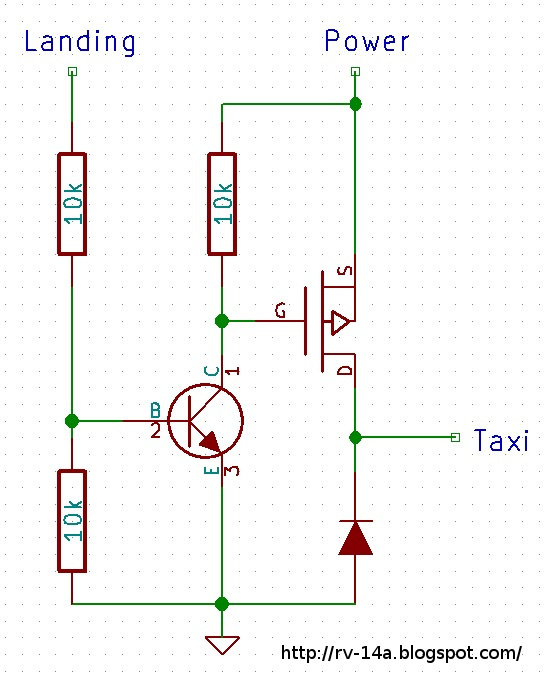 When the taxi light is selected, the diode prevents the landing light from being powered (option 2). 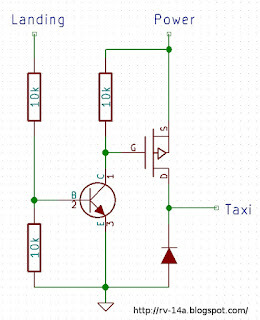 However, when the landing light is selected, the diode permits powering the taxi light (option 4). In this way, one can select "off", "taxi" or "taxi+landing" with a single switch (or "off", "nav" or "nav+strobe"). 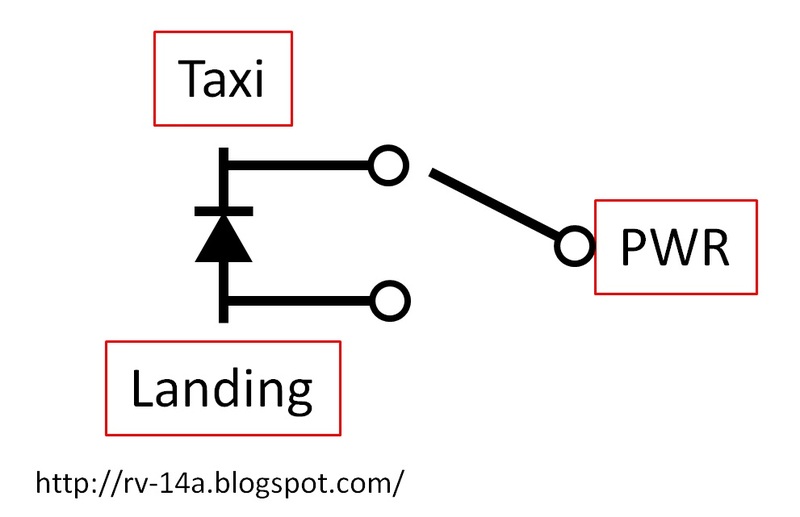 The issue with using a diode is that its forward voltage drop causes heat generation when taxi+landing is selected. This is especially an issue with a high current taxi light, like mine and a non-issue with the nav/strobe lights (due to their lower current demand). Initially, I used a high current Schottky with a Vf of 0.58 V (somehow I managed not to take a picture of that setup). However, with the taxi light pulling 7.3 A when set to "high", that means the diode will create more than 4 W of heat. And it sure did! That was too much heat (again, this wasn't an issue with the nav/strobe lights since the navigation lights pulled only about 400 mA). A more efficient approach would be to use a high-sided FET in a switching configuration, like shown below. 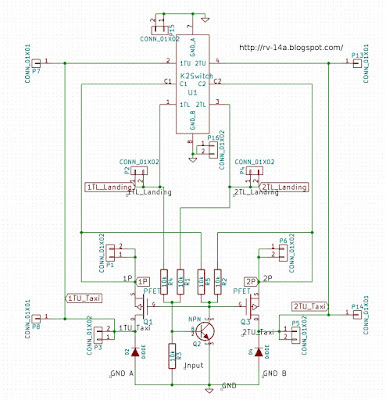 The PFET will only be switched on when its gate is effectively brought to ground. This occurs when the landing light (or strobe) is powered on by the switch (not shown). When that happens, the NPN is switched on since VBE>0.7 V. With the transistor on, its VCE is brought from +12 V to effectively ground. With the FET's gate now at ground, VGS is effectively -12 V, switching the FET on so that the +12 V at the source is now presented at the drain, where the taxi light is (or nav). The taxi light (or nav) is then powered on with the landing light (or strobe). Since RDS for a FET is tiny (in my case, less than 0.004 Ohms! ), there is a negligible amount of heat generated, even with more than 7 A being pulled through for a taxi light (which amounts to less than 30 mW of heat in the PFET). Finally, a diode is placed to provide a path for the collapse of the magnetic field in case of any inductive reactance in the load (a.k.a., a flyback diode). With my planned approach determined, next I needed to design the circuit board appropriate for the OTTO K2 DPDT switch I planned to use (left). I wanted my circuit board to plug in directly to the K2. Here is a diagram I made to better show the K2's terminal connections (right). 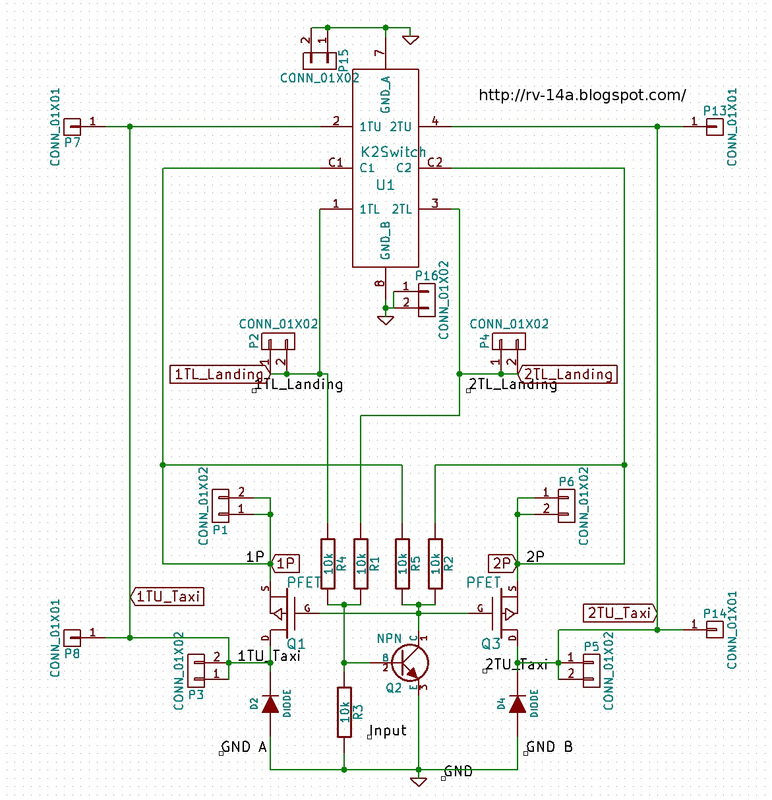 My schematic is below. It's a bit messy to present. The K2 switch terminals are represented in the upper center. Each K2 terminal needs a female tab so it can plug in to the switch. In additional, each terminal needs a male tab to receive the wires (e.g., ground, power, landing and taxi or ground, power, nav and strobe). The switch is DPDT, so that left and right lights can be on separate fuses (or wing and tail nav/strobes). 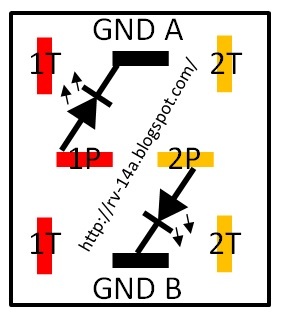 A single NPN transistor controls both the left and right PFETs. In case the fuse blows on either side, the NPN is powered from both inputs, so a blown fuse will not result in the PFET changing its state and turning on or off a taxi light (and with 20 k-ohms between each powered input, neither side can power the other through that connection, should a fuse blow). Finally, should the circuit fail, the lights are still controllable mechanically through the switch: If a PFET remains off, then either lighting position can be selected, so either 'landing or taxi' or 'nav or strobe'. If a PFET remains on then either 'taxi or landing+taxi' or 'nav or nav+strobe' can be selected. 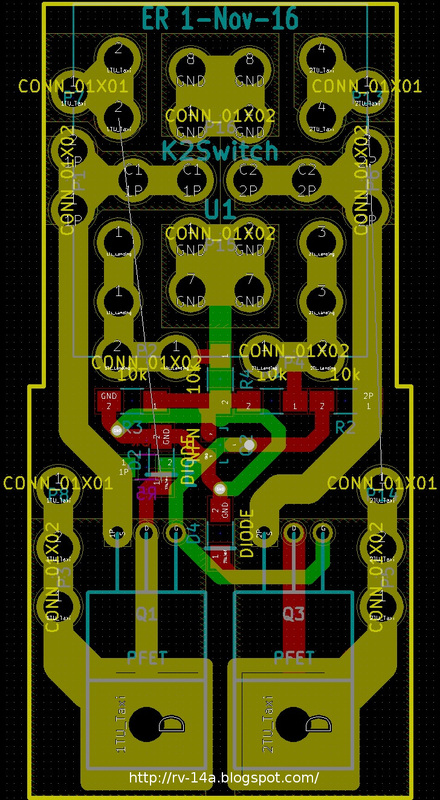 Next I needed to design the circuit board so that I can just plug it in to the back of the K2 switch. Using a micrometer and the K2 specs sheet, I mapped out the dimensions necessary. Since space was limited due to the proximity of other switches on my panel (left), the board needed to be about the same width as the switch itself. That criterion also necessitated using surface mount components. The right image shows the board design. The boards were then manufactured. The top image shows the front and back of the board (actually, the right board is an earlier revision, but it's similar enough to my final design). The bottom images show the front (left) and back (right) after I soldered one up. The two red jumper wires were necessary since, when designing the board above, I ran out of room to lay down associated traces. Lastly, the observant will notice that the PFETs are held down by LP4-3 rivets (hey, it's an airplane, right?). And finally, here are two boards plugged in to the back of both my nav/strobe and landing light K2 switches. After running the taxi+landing lights on for 15 minutes, the PFETs do not get noticeably warm (same for the nav/strobes, however they have much lower average current so it wasn't an issue). Success! As an aside, the wigwag line for my lights are active low. Yet I wanted the panel switch to light up when wigwag was selected. So I needed to use an independent rather than dependent light OTTO K1. To make sure the light turned on when wigwag was selected, I had to switch in the ground to the K1's light. However, when the switch was off, the wigwag line would be connected to the ground of the K1's light. Unfortunately, the wigwag line floated low enough to cause the OTTO K1 switch to illuminate slightly when wigwag was off (i.e., the landing light control line was sinking current from the switch's light). Can't have that! Hence the simple isolating Schottky diode on the switch. In the above image, you can see that diode encased in a few layers of heat shrink tubing (it's the clear heat shrinked discrete on the ride side). 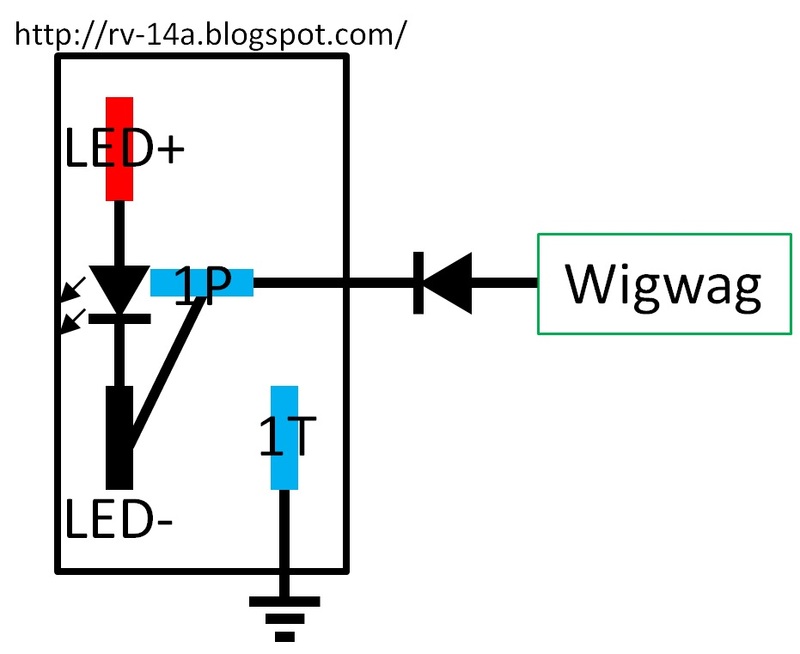 Below shows a representation of the circuit for the wigwag switch. 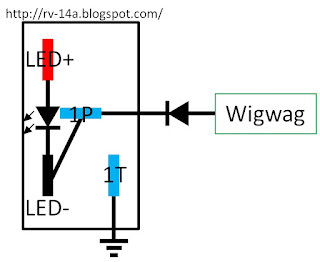 To ensure that wigwag line is pulled low enough when the switch is thrown, that diode I chose has a Vf of 450 mV. For the curious, as in the case of when I designed my panel, I am a proponent of open-source software. 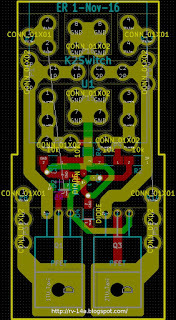 For schematic generation and board layout, I used KiCAD. And there are a myriad of so-called "board houses" that manufacture circuit boards when provided with the CAD files for one's design. Then it's just a matter of whipping out the soldering iron and affixing the components.